Ha, I’m one too. My son does not like me to touch his books. I do like the bottle, with its sort of woody cap, and tasteful simple label. That is appealing. I can see that on my dressing table. I have tried 4 of this line so far and didn’t like any of them, but if a tester passed my way I would try it as the notes sound good. I got a lot of laughs from description and the comments on this one. I do like the bottle a lot. He’s a very talented guy and I really loved L’eau Scandaleuse, it’s a very rich buttery tuberose….one of the best and far superior to Fracas or Carnal Flower. I would love to try this one, the blurb is weird but it’s all about the juice. He uses high quality ingredients and they are not over-priced for a niche house. Look forward to finding this one! That label is just annoying the heck out of me, mainly because it looks like something printed out at home, never quite finding the right font and margins. I like the curvy bottle and wood cap, but the label doesn’t harmonize with it. I know, I should be grateful they didn’t waste more of the budget on packaging, but I’m not. I’d try it if I got a sample, though. Agreed! I am a graphic designer so these sorts of things really bug me. It looks like a prototype of the scent while still in development, or an attempt at ‘artisanal’. The bottle and cap look like some thought and budget were put into what they’ve chosen. What happened with the label? Thanks for your insights, viridiaan. Glad to know I’m not just cranky. BTW, I took a look at the Anatole Lebreton website and found it also a bit awkward looking. So I think they just didn’t invest in graphic design, whether because of budget or not really noticing it themselves. Just checked out the site. You’re right, they could use some help there as well. Perhaps they’ll read our comments! Just nuts about Incarnata (as a masculine; probably devastating on a woman). 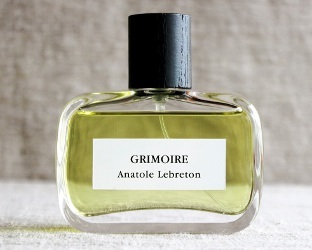 Lebreton is a really inventive new voice in fragrance to me. I can’t imagine mass popularity for the line, but surely fume heads will be impressed. My mom REELED at L’ Eau Scandaleuse on Christmas Eve, due to the skin/poopy back note; I on the other hand like it more every time I smell it. I hope Grimoire lives up to that standard, though I confess to weariness with witchy names! He likely didn’t mean “salivating” fingers, rather “spit-moistened” fingers. We have to forbear the bad translation work; I imagine my translations from English into French would stink! Une fenêtre ouvert laisse entrer les odeurs provenant des champs et du jardin des herbes. Un peu de poussière flotte en silence dans l’air illuminé par le soleil rouge. Au loin, des chants profanes perturbent la lecture studieuse des pages endommagées. Travail savany avec des formules hermétiques, leverer vos secrets parfumés par olibanum; le grimoire puissant révéler vos embrassements, élever l’âme, enflammer les sens comme les fumées d’encens qui montent et font l’écriture du livre avec des dorures et des coins jaunis par les doigts salivés danse. Une fenêtre entre-ouverte laisse passer les odeurs des champs et du jardin des simples. De la poussière flotte dans l’air éclairé par le soleil rougissant. Au loin des chants profanes viennent troubler la lecture studieuse des pages abîmées. embrase les sens comme les fumées d’encens qui montent et font danser l’écriture du livre aux dorures passées et aux coins jaunis par des doigts salivés. Thanks, des esseintes! Does it sound OK in the original French? Really looking forward to it, I quite liked the first four Lebretons and the notes sound up my alley. I don’t read the ad copy anymore — I’m often too baffled to really be amused by it.